Ultimate Spider-Man versus Venom! Who is the new Venom? What is his terrible connection to Miles Morales’ father? Cover- Miles Morales all but consumed by Venom on an all white background is much effective. Batwing #17’s sparse background was glaring this one was deliberately done and perfectly executed. 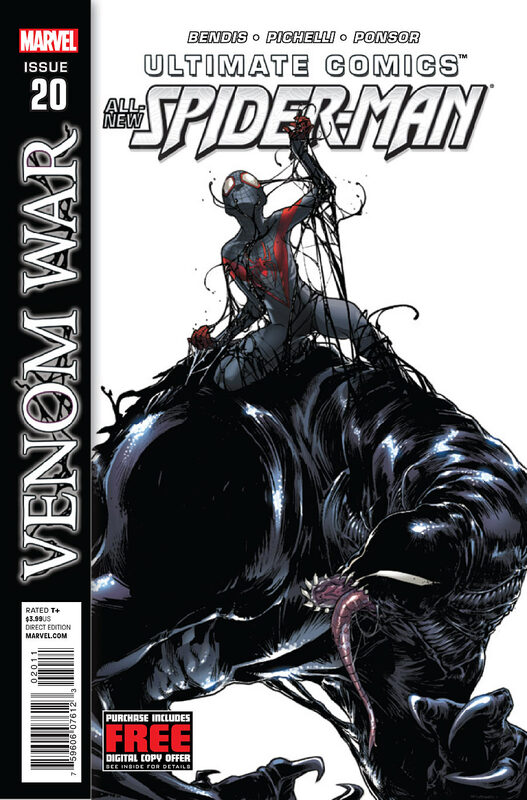 Villain- So Venom is back and he’s bringing a world of hurt to Miles Morales and those close to him. Emotion- As usual Pichelli’s art conveyed just enough of what was going through Miles mind to make this a very touching tale especially with Miles breakdown at the end. Art- Sarah Pichelli as always does stellar work on every page. Her Venom is particularly nasty looking! Blame- So now we have the reason for Miles Morales wanting to “Quit” the Spider-Man mantle after his father Jefferson is gravely injured because Venom traced his identity so close to home. Action- The Miles vs Venom fight was pretty awesome despite Miles way too amateur handling of the villain.